Infrared astronomy involves the use of special telescopes that detect electromagnetic radiation (radiation that transmits energy through the inter-action of electricity and magnetism) at infrared wavelengths. The recent development of this technology has led to the discovery of many new stars, galaxies, asteroids, and quasars. Light is a form of electromagnetic radiation. The different colors of light that our eyes can detect correspond to different wavelengths of light. Red light has the longest wavelength; violet has the shortest. Orange, yellow, green, blue, and indigo are in between. Infrared light, ultraviolet light, radio waves, microwaves, and gamma rays are all forms of electromagnetic radiation, but they differ in wavelength and frequency. Infrared light has slightly longer wavelengths than red light. Our eyes cannot detect infrared light, but we can feel it as heat. Two types of infrared telescopes exist: those on the ground and those carried into space by satellites. The use of ground-based telescopes is somewhat limited because carbon dioxide and water in the atmosphere absorb much of the incoming infrared radiation. The best observations are made at high altitudes in areas with dry climates. 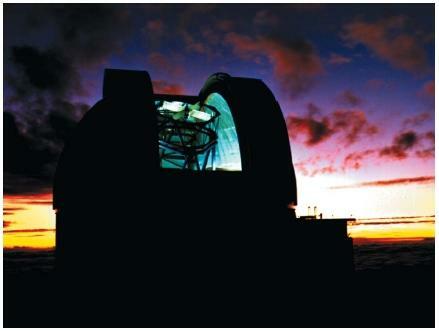 Since infrared telescopes are not affected by light, they can be used during the day as well as at night. Dwarf galaxy: An unusually small, faint group of stars. Infrared detector: An electronic device for sensing infrared light. Optical (visible) light: Portion of the electromagnetic spectrum that we can detect with our eyes. Redshift: Shift of an object's light spectrum toward the red-end of the visible light range—an indication that the object is moving away from the observer. Stellar nurseries: Areas within glowing clouds of gas and dust where new stars are formed. Space-based infrared telescopes pick up much of the infrared radiation that is blocked by Earth's atmosphere. In the early 1980s, an international group made up of the United States, England, and the Netherlands launched the Infrared Astronomical Satellite (IRAS). Before running out of liquid helium (which the satellite used to cool its infrared detectors) in 1983, IRAS uncovered never-before-seen parts of the Milky Way, the galaxy that's home to our solar system. In 1995, the European Space Agency launched the Infrared Space Observatory (ISO), an astronomical satellite. Before it ran out of liquid helium in 1998, the ISO discovered protostars, planet-forming nebula around dying stars, and water throughout the universe (including in the gas giants like the planets Saturn and Uranus). In mid-2002, the National Aeronautics and Space Administration (NASA) plans to launch the Space Infrared Telescope Facility (SIRTF), which will see infrared radiation and peer through the veil of gas and dust that obscures most of the universe from view. It will be the most sensitive instrument ever to look at the infrared spectrum in the universe. SIRTF researchers will study massive black holes, young dusty star systems, and the evolution of galaxies up to 12 billion light-years away. Infrared telescopes have helped astronomers find where new stars are forming, areas known as stellar nurseries. A star forms from a collapsing cloud of gas and dust. Forming and newly formed stars are still enshrouded by a cocoon of dust that blocks optical light. Thus infrared astronomers can more easily probe these stellar nurseries than optical astronomers can. The view of the center of our galaxy is also blocked by large amounts of interstellar dust. The galactic center is more easily seen by infrared than by optical astronomers. With the aid of infrared telescopes, astronomers have also located a number of new galaxies, many too far away to be seen by visible light. Some of these are dwarf galaxies, which are more plentiful—but contain fewer stars—than visible galaxies. The discovery of these infrared dwarf galaxies has led to the theory that they once dominated the universe and then came together over time to form visible galaxies, such as the Milky Way. With the growing use of infrared astronomy, scientists have learned that galaxies contain many more stars than had ever been imagined. Infrared telescopes can detect radiation from relatively cool stars, which give off no visible light. Many of these stars are the size of the Sun. These discoveries have drastically changed scientists' calculations of the total mass in the universe. Infrared detectors have also been used to observe far-away objects such as quasars. Quasars have large redshifts, which indicate that they are moving away from Earth at high speeds. In a redshifted object, the waves of radiation are lengthened and shifted toward the red end of the spectrum. Since the redshift of quasars is so great, their visible light gets stretched into infrared wavelengths. While these infrared wavelengths are undetectable with optical telescopes, they are easily viewed with infrared telescopes. If it's possible send me please where I can find IR spectrum of all Earth from Space?